You always wanted to know how to paper train a Green Iguana, didn't you? Would you like to open your iguana enclosure and let your lizard loose in your sun porch every now and then? Letting them out of the confines of the cage allows them freedom to exercise by climbing well-placed structures and to absorb natural sunlight when available. Without proper training, they'll do their business wherever they see fit. Well, we can't have that! This won't happen quickly but it will happen, with persistence. 1. Decide where you want your Iguana to go to the bathroom and lay down several layers of Newspaper. The base of a climbing/sunning structure works best. It also helps to keep this spot relatively close to where you feed your Iguana when outside of the enclosure. But, don't put them side by side. Most creatures would prefer not to eat in the same vicinity as their designated bathroom area. 2. Watch your Iguana during feeding time. As soon as it has finished and moves away from the food, gently pick it up and place it on the newspaper. Don't move too suddenly, grab it too hard or make any loud noises. You want to create a pleasant trauma-free learning experience to prevent your reptile from reacting out of fear! 3. Hold the Iguana gently in place during the initially training period, if necessary. Spray the Iguana down with warm water from a plant mister. A warm water spray is a pleasant treat for them. This also naturally stimulates them to defecate after a full meal. Your Veterinarian may also instruct you to spray a dilution of Epsom Salts, Vitamin infused water or Sports drink to aid a sick reptile in healing. 4. Repeat this process for a few days. Longer if necessary. You will find the results well worth it for both of you! 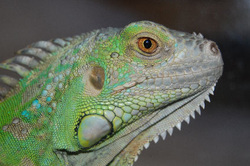 Green Iguanas want their habitats and iguana cages as clean as you do. A sunning spot on the porch is no different. Teaching them how to cooperate makes this a shared reward! * Do this while they are young and it will be easier for them to learn. * Reward them with a simple treat, such as a meal worm or scratch them on their favorite spot. * Be sure to provide adequate shade and fresh water to prevent dehydration. * If your Iguana currently uses a water bowl or pool as a toilet, remove it during training but provide an alternate source of water. * Green Iguanas can grow to a length of about 5 feet and weigh as much as 35 pounds, under ideal conditions. * Never allow them to climb on things they might pull over or tear when full grown. This includes curtains. In other words, don't teach them bad habits! * Be careful when cleaning up after your pet iguana. Droppings can transmit salmonella. * If you provide a pool for swimming, make sure your Iguana can easily climb in and out.